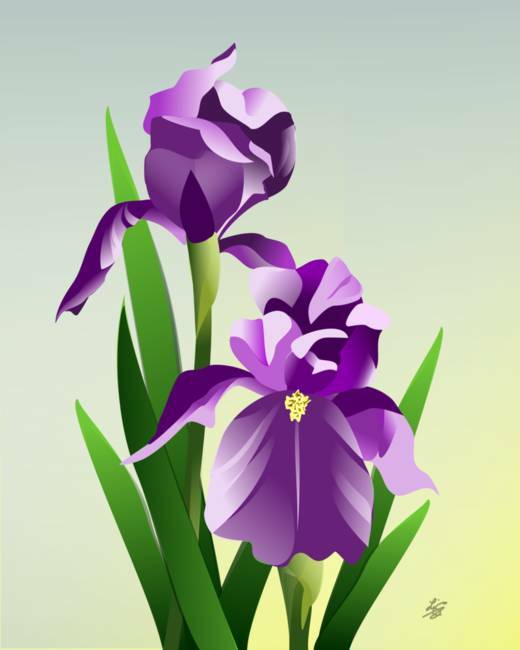 I made this purple Bearded Iris painting in a vector graphics program. It's based on an original acrylic painting I made recently. The really cool thing about creating digital art is that you can make all sorts of changes without ruining the artwork. I often have a hard time deciding on the background for my artwork and this Iris was no exception. I finally decided on a gradient that goes from a soft blue to a pale yellow in the lower corner to resemble a hint of summer sunshine.to versions Available at Imagekind on prints and canvas. Note by default the product page will show a framed print but you can easily change to unframed from the options underneath the framed print as well as choose a size.